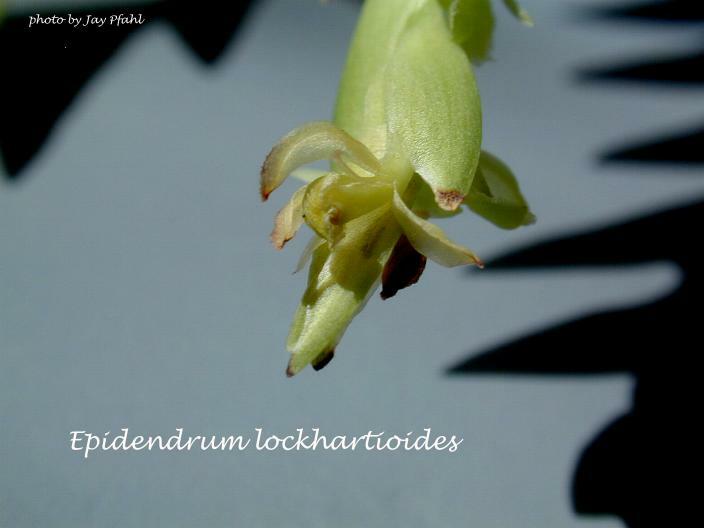 Epidendrum lockhartioides Schltr. 1923 GROUP Spathiger SUBGROUP Lockhartioides type Photo by © Jay Pfahl. Another Clone Photo by © Eric Hunt. Plant and Flowers in situ Ecuador Photo by © Lourens Grobler. 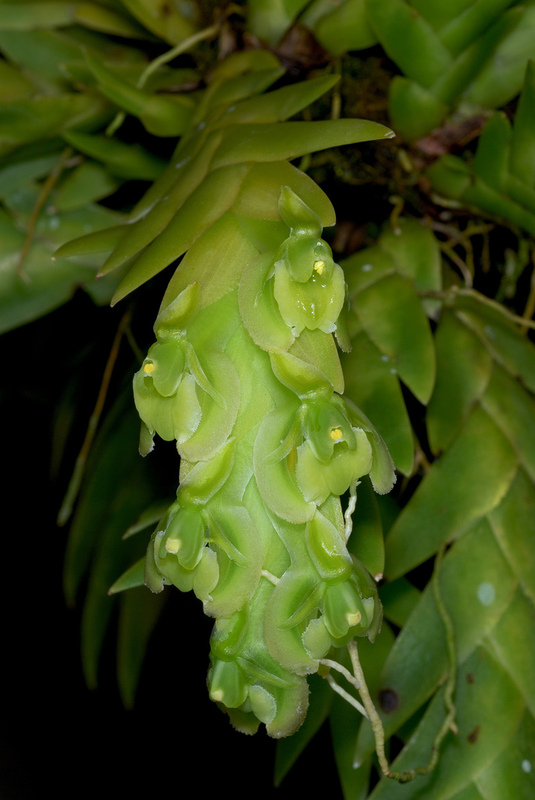 Found in Costa Rica, Panama, Colombia and Ecuador at elevations of 50 to 750 meters as a smaller sized, pendant hot to warm growing epiphyte with imbricating triangular, conduplicate basally clasping leaves that somewhat resembles a Lockhartia in plant form but blooms terminally with a short. 2" [5 cm] imbricating inflorescence with a few, succulent, simultaneously opening, fleshy flowers that face down, appearing out of the elliptic, strongly compressed bracts all along the spike. Best to grow mounted to accomodate the pendant growth habit. 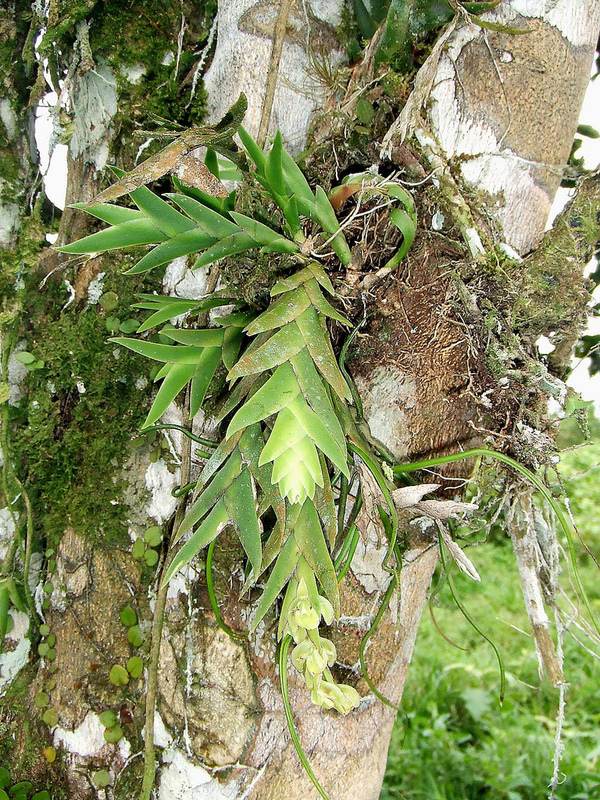 Separated from others by its 6 to 8 equitant, triangular leaves similar to the floral bracts, and a lip with a wide, prominent keel at the apex.